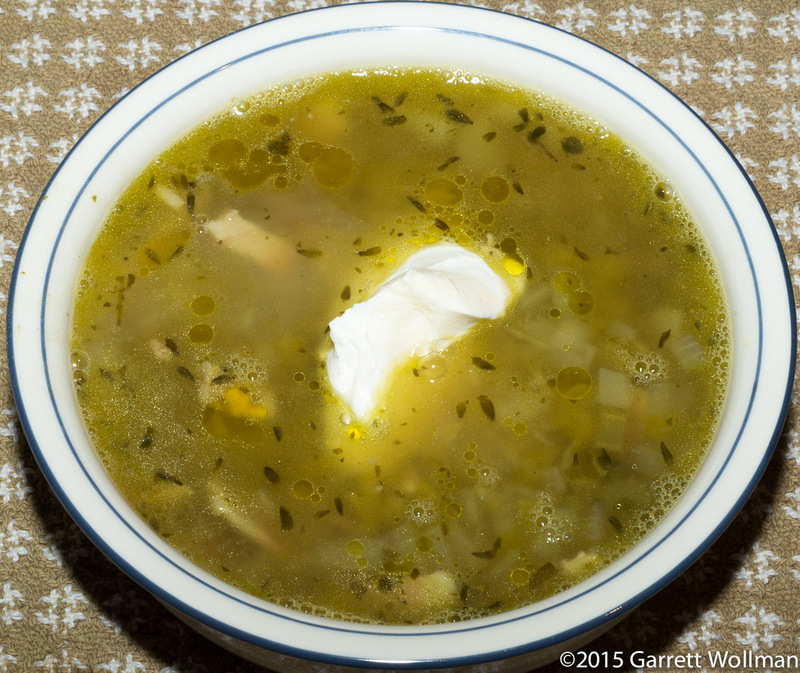 Despite what it may sometimes seem from this blog, not every recipe I try turns out. Today I’m writing about two recipes from Deborah Krasner’s cookbook Good Meat , neither of which was worth the effort. I don’t know where either one went wrong: it’s possible (nay, likely) that I did something wrong, but it’s also possible that these recipes were poorly specified, received inadequate testing, or contain hidden assumptions about the desired outcome that I simply didn’t share. My general view is that you’re going to cook with bacon, or indeed any meat, then you really have a right to expect that the results will taste like bacon — anything else is unnecessarily wasteful (you could even argue immoral). Neither of these two dishes has that effect, and while I have some ideas, not one fully explains the results on its own. I’ll go over both of them (I interleaved the cooking processes) below. 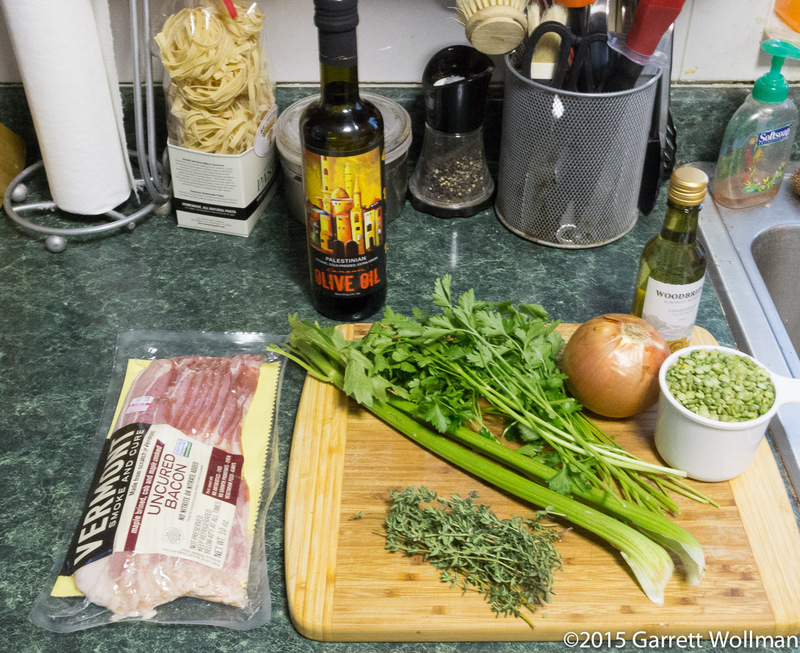 The first step is to prep the bacon, by cutting it into little batons. 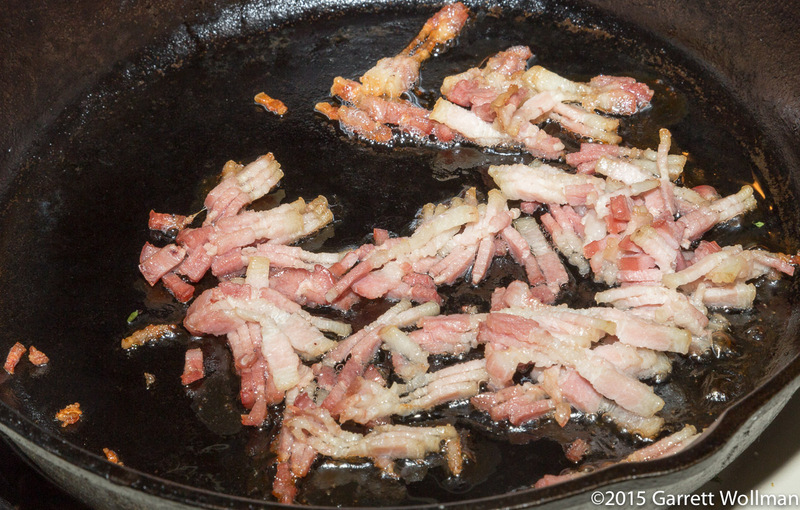 Here’s where things start (I suspect) to go wrong: Krasner writes, “Heat a 3-quart Dutch oven over low heat, and when the rim feels hot to the touch, add the bacon. 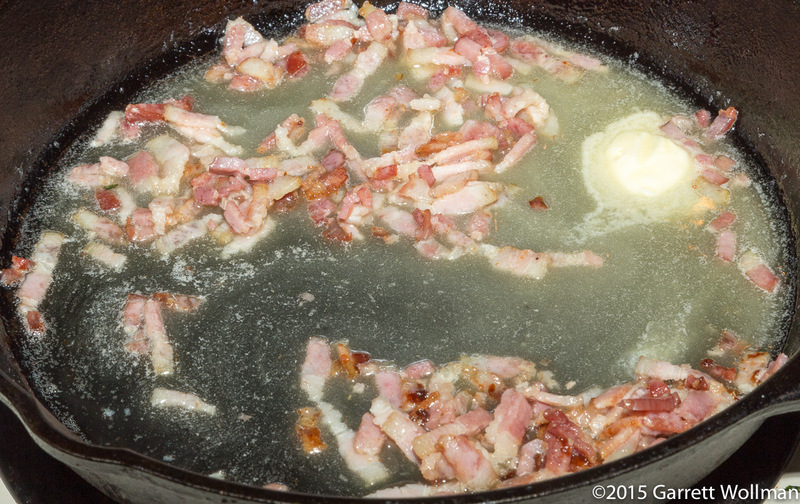 Cook slowly over low heat to partially render the bacon fat. Add the olive oil.” Now you’ll recall that there are two ways you get flavor from bacon: the meat itself — and this bacon is disappointingly fatty — and from the curing and smoking process, which affects only the outer millimeter or two of the whole pork belly. Despite being “thick cut” bacon, there isn’t a whole lot of smoke flavor to be had here, and rendering it only partially, over low heat, is not going to develop much in the way of meaty flavors (whether from glutamate or Maillard browning) either. 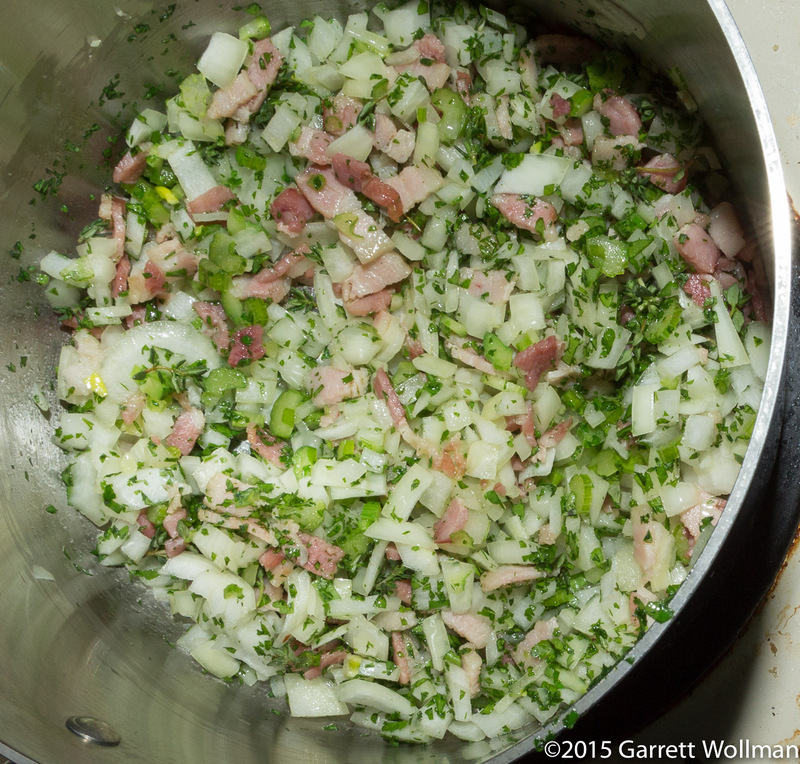 After adding the onion, celery, and herbs to the bacon, it still doesn’t look like much. The instructions say to leave it on low heat (so this is a sweat, not a sauté) until the aromatics soften, which is fairly common, but the bacon still looks underdone. Next, the white wine is added, which the instructions imply will deglaze the pot, but this vessel has never been above “low” so there simply is no fond to deglaze in the first place. (So it should be unsurprising that there’s little flavor in the finished dish, either!) 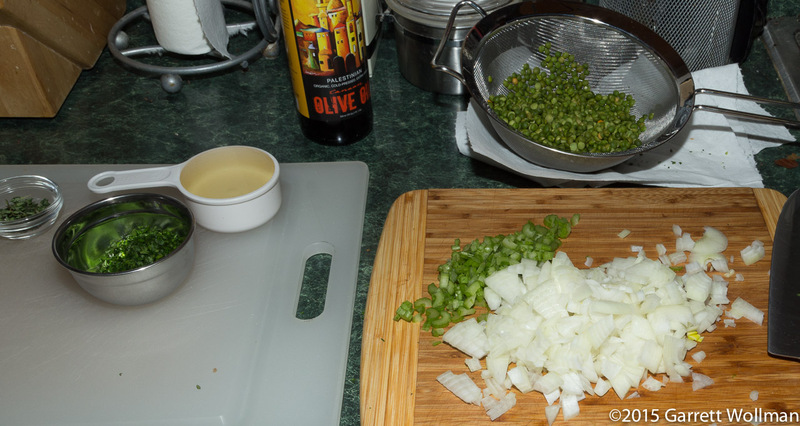 At least at this point we get to raise the heat (temporarily) to medium-high — but that has no effect, since the added heat is immediately quenched by adding first the (rinsed) split peas and then an unspecified quantity of cold water. 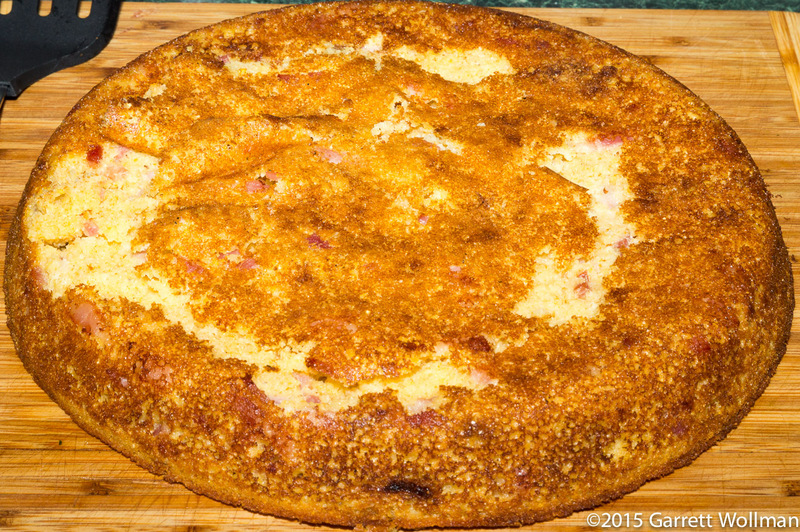 Now we turn to the cornbread (“Sweet and Salty Bacon Corn Bread”, p. 224). 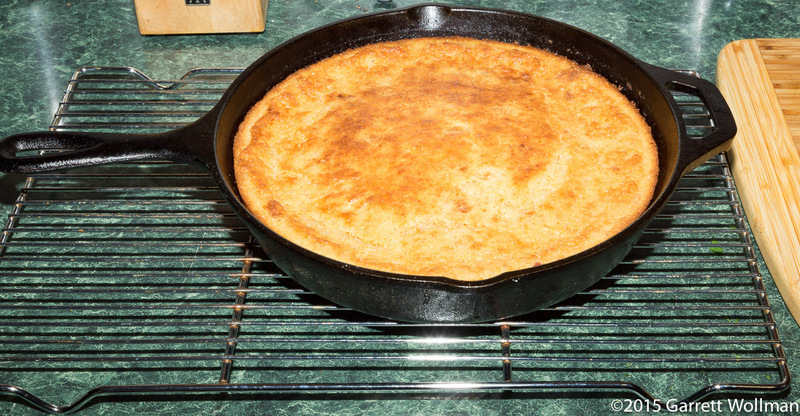 This cornbread is made in a cast-iron skillet, and starts by rendering bacon (the same kind and quantity as was used in the soup), which is done in the skillet itself, while it’s heating in the oven. At 425°F there’s at least a chance of some Maillard browning in this process! 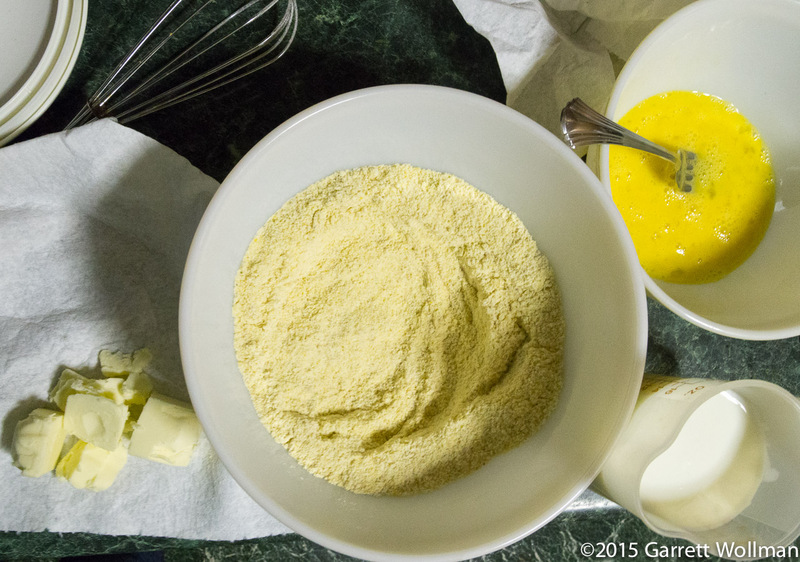 The other ingredients are shown here: butter, cornmeal, brown and white sugars, baking soda, salt, eggs, and buttermilk. What was I saying about the bacon getting properly browned and rendered? Well, there’s a little bit of it, but not nearly as much as I would like. Still, the recipe said “10 minutes”, so that’s what it gets. The cornbread is made by a modified version of what Alton Brown calls “the muffin method”: dry ingredients are mixed thoroughly first, then liquid ingredients — eggs, buttermilk, and melted fat — are dumped on top, and the whole thing is stirred only enough to come together as a batter with no dry pockets. Then the batter is dumped into the pan and baked in the same hot (425°F, 220°C) oven as before. The cornbread looks pretty good, at least on top. 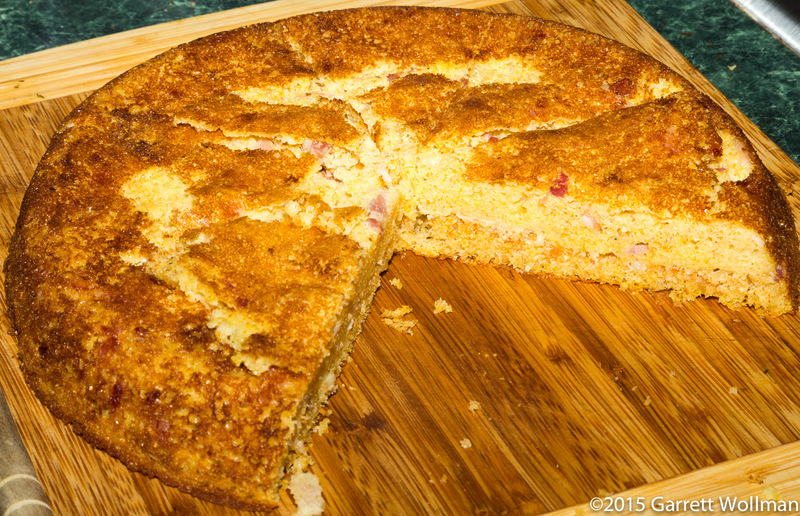 It doesn’t taste especially bacon-y — but it does taste like corn, as a good cornbread should, since it’s made with cornmeal alone, no wheat flour to dilute the corn-y flavor. But there’s a problem: getting it out of the pan. My cast-iron skillet is apparently not seasoned enough for this task, and I had to scrape off a thin layer of cornbread that was stuck to the bottom of the pan despite the substantial amount of fat that went in. Back to the pea soup. After adding in the water, it took about 15 minutes to come to a simmer, and then it cooked, covered, for another hour or so. In the end, it was disappointingly watery, needed a lot of salt and pepper, and has nothing of the creamy texture or smoky flavor I expect and desire from a pea soup. I made 1.55 kg of soup, giving four portions of 388 g each; I expect that each leftover portion will need to be cooked for quite a long time on the reheat to make it worth eating at all. The soup is finished, after portioning, with 2 tablespoons of sour cream, a drizzle of olive oil, and a splash of vinegar. None of these made any difference to the disappointing, watery soup. At least it’s only 271 kcal per serving! Final verdict: both of these recipes were a complete waste of time, effort, and bacon. The cornbread is at least acceptable as a cornbread — I can’t say the same for the pea soup, which is more of an herbal broth with bits of pea and bacon in it. 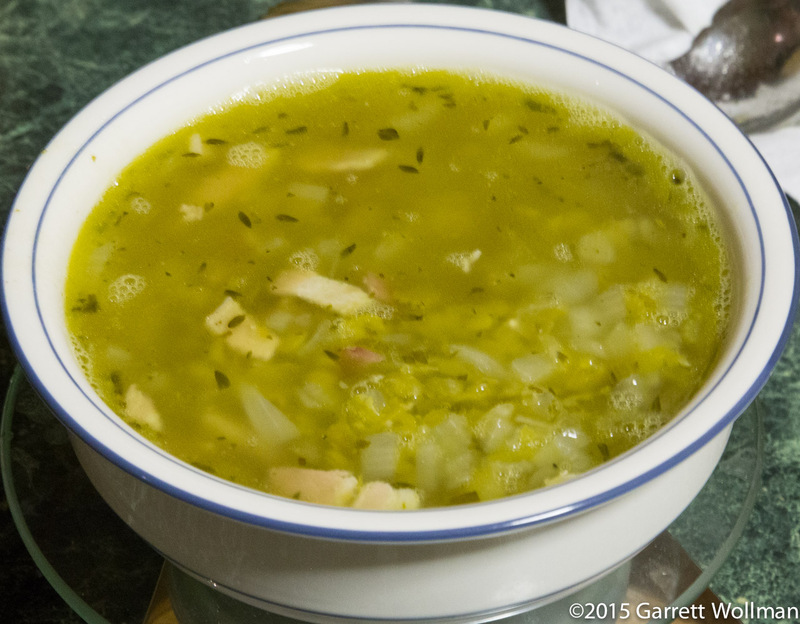 Gallery | This entry was posted in Food and tagged bacon, cornbread, Deborah Krasner, pea soup, recipe. Bookmark the permalink.